Cycles of flood and drought in the African Sahel are legendary, and they have provided the impetus for major waterworks on Africa’s great rivers. The construction of the Aswan High Dam on the Nile River, creating Lake Nasser in the 1960s, is the biggest and most visible project. Heavy rains in the source regions of the Nile in the 1990s resulted in record water levels in Lake Nasser. The abundance of water facilitated the Egyptian government’s promotion of another massive water distribution system called the New Valley. 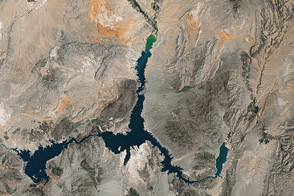 In 1997, Lake Nasser began flooding westward down a spillway into the Toshka depression in southern Egypt, creating four new lakes over the next few years. Following the initial flooding, a pumping station and canal were constructed in 2000 to maintain water flow into the region, allowing for industrial and agricultural development in the desert. 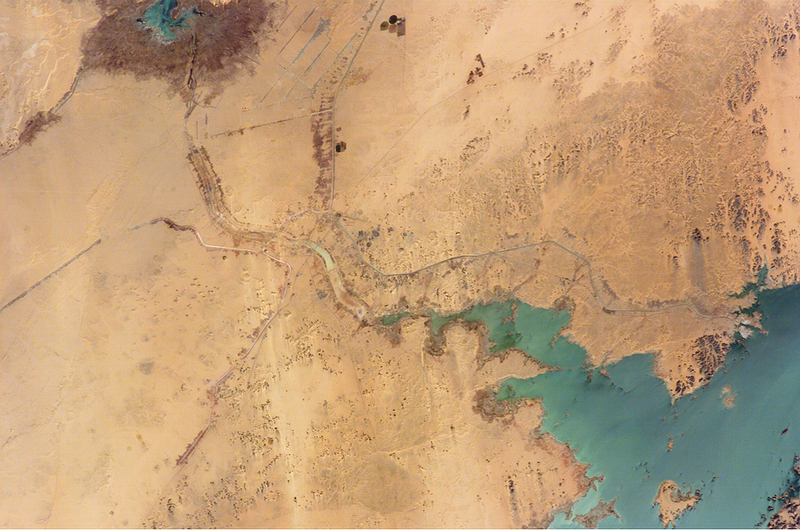 This view shows the completed Mubarek Pumping Station on Lake Nasser, the spillway that originally flooded the Toshka depression, the southern end of the first of the Toshka Lakes, part of the 50-kilometer-long main canal (the Sheikh Zayed Canal), side canals, and several new fields in the Egyptian desert northwest of Lake Nasser. Astronauts, cosmonauts, and space-based sensors have been monitoring these developments in Egypt since their inception in the late 1990s. 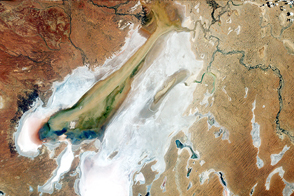 The New Valley’s Toshka Lakes, and the new developments surrounding them, represent one of the most visible and rapid man-made changes on the Earth’s surface. Astronaut photograph ISS012-E-11654 was acquired December 11, 2005, with a Kodak 760C digital camera using an 180 mm lens, and is provided by the ISS Crew Earth Observations experiment and the Image Science & Analysis Group, Johnson Space Center. The International Space Station Program supports the laboratory to help astronauts take pictures of Earth that will be of the greatest value to scientists and the public, and to make those images freely available on the Internet. Additional images taken by astronauts and cosmonauts can be viewed at the NASA/JSC Gateway to Astronaut Photography of Earth. Heavy rains in the source regions of the Nile in the 1990s resulted in record water levels in Lake Nasser. 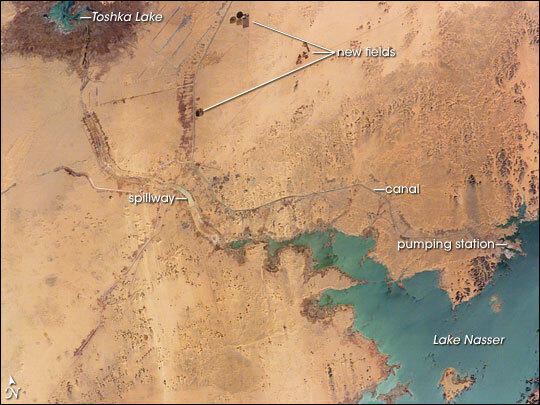 In 1997, Lake Nasser began flooding westward down a spillway into the Toshka depression in southern Egypt, creating four new lakes over the next few years.